The gluteus medius (gMed) is a key stabilizer muscle of the hip joint, which acts to abduct and both externally and internally rotate the hip. It therefore plays an important role in knee joint alignment. There are many injuries in which a weak or misfiring gMed is implicated. These include IT band syndrome, patellofemoral pain syndrome and Achilles tendinopathy to name just a few. 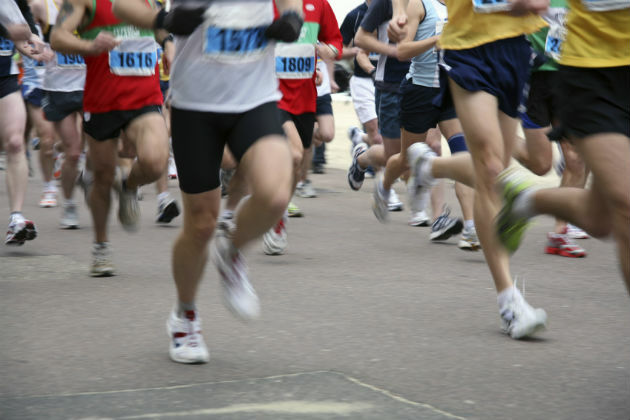 It's no coincidence that the injuries listed here are all injuries commonly suffered by runners. Running is performed largely in one plane of motion — the sagittal plane (i.e., forwards). The gMed works hardest in the two other planes, frontal (side to side) and transverse (in rotation). Therefore, if an individual's sole form of exercise is running, the gMed doesn't get a good workout and can become, relatively speaking, weak. A weak gMed will cause the pelvis of the free-standing side to drop when weight bearing on a single leg. This is known as a Trendelenburg gate. To compensate for this and in an attempt to maintain a neutral pelvis, the hip is allowed to excessively adduct and internally rotate. This motion then translates down the femur to the knee. This can clearly be seen in severe cases as the knees turn in and fall together. For example, when squatting. What is agreed is that in these cases, the gMed needs to be strengthened to help stabilize the pelvis and align the knee. What is yet to be agreed is the best exercise(s) to achieve this. Most of the controversy lies with performing weight bearing, functional exercises versus side-lying exercises. This is perhaps one of the most simple exercises used to strengthen the hip abductor muscles. The patient lays on their side, working leg on top, knees straight and hips stacked. The top leg is then lifted up, as high as possible, whilst maintaining pelvic stability. This exercise has consistently been shown to be the most effective in recruiting gMed — with an approximately 80 percent maximal voluntary isometric contraction (MVIC) on EMG testing (1,2,3). The positives with this exercise are of course the gMed activity levels, as well as the simplicity of the exercise and it's low level of pain reproduction — for knee injuries especially. Another bonus is that, when performed correctly (with the hips in neutral and knees completely straight), it virtually isolates the gMed — reducing the role played by TFL and gluteus medius. The downside is the lack of weight-bearing functionality, which leads many professionals to argue that instructing patients to perform this exercise is a waste of time. The clam exercise is another commonly used gMed strengthening exercise. It again is performed in a side-lying position with the working leg on top and hips stacked, but this time the knees are bent to around 60 degrees, with the hips also slightly flexed. The feet stay in contact as the top knee is lifted away from the bottom one. The biggest mistake patients make with this exercise is rolling the pelvis back as the knee is lifted. GMed MVIC has been shown to be much lower for this exercise than the side-lying hip abduction, at no more than 40 percent (1). However, there are several variations of the clam exercise which progressively challenge the patient and do, according to Boren et al. (4), increase gMed MVIC as high as 77 percent! Variation 4, which elicited the highest result, involved starting with the hip in neutral (rather than slight flexion) and femur horizontal with knees apart. The femur maintains this position as the top ankle is lifted towards the ceiling, rotating the hip to do so. If the modified version of the clam exercise described in Boren's paper can achieve up to a 77 percent MVIC, then its performance is just as warranted as the side-lying hip abduction exercise. It does, however, suffer from the same negatives, as well as the reduced gMed muscle specificity that a pure hip abduction exercise would produce. The side plank position is used, I find, a little less frequently than the two described above, when aiming to strengthen the hip abductors. It can be performed either as a full side plank with only the forearm and bottom foot on the floor, or as a half version, where the knees are bent and weight distributed between the lateral bottom knee and the forearm. Boren et al. found this exercise to produce the highest %MVIC at a whopping 103 percent (note that side-lying hip abduction was not tested). Whilst this exercise could also be berated for not being functional, it is indeed a weight-bearing exercise which should mean it scores a few more brownie points — and with a %MVIC like that, surely it can be considered a front runner in the gMed strengthening stakes. This is also known as the pelvic drop. This is a weight-bearing exercise that involves standing on one leg and maintaining knee extension, whilst the free standing pelvis is lifted (hitched) up, and then down, in a slow, controlled manner. This exercise has been shown to produce a 58 percent (4) and a 57 percent MVIC (5), so definitely lower than the exercises list above. However, this one has the benefit of being particularly functional for runners. Whilst running, we are looking to maintain a neutral pelvis position to prevent the nonweight-bearing side from dropping. What better than an exercise that practices just that? It also has a low incidence of knee pain reproduction. The single leg squat is a favorite among many rehab professionals for many differing ailments. It's a fairly self-explanatory exercise, although can be difficult to master the technique to a tee and requires a certain level of strength and control elsewhere to achieve and maintain good form. It also is likely to aggravate knee symptoms in those with conditions such as PFPS or ITBS. That being said, it is one of the most functional exercises out there for many sporting actions and day-to-day tasks. However, it has been shown to produce mixed results with one study reporting an 82 percent MVIC (4), and two others coming in at 64 percent MVIC (1,2). This exercise seems to be the most controversial amongst the research in terms of its gMed activation levels. My personal speculation is that the level of gMed activation during this exercise depends at least in part on its execution. Any professional prescribing this exercise should be confident that the patient is able to perform the exercise with good form and needs to ensure that the patient does not continue if symptoms are aggravated. The wall press exercise is a single-leg weight-bearing exercise that involves standing side-on to a wall and flexing the knee and hip of the leg closest to the wall to 90 degrees. The lateral surfaces of the thigh, knee and ankle are then pushed against the wall in an isometric abduction force, holding for five seconds and repeating. This exercise was tested by O'Sullivan et al (6) who found it produced a 76 percent MVIC, top in their study. The other exercises tested were the hip hitch (pelvic drop) and the single-leg wall squat. Whilst this exercise is weight bearing and produced a good %MVIC, there could be some debate over the level of functionality. Finally, the lateral band walk uses a section of resistance band (theraband/exercise tubing) tied around the ankles of the patient. In a quarter-squat position, the patient then walks in a lateral direction, abducting the leading hip against the resistance of the band. Destafano (1) and Presswood (2) both included this exercise in their studies, with the latter reporting an MVIC of 61 percent. This is the lowest of the gMed EMG activity scores presented, but it could have useful applications due to its weight-bearing and functional elements, and the reduced risk of knee pain reproduction. A successful gluteus medius strengthening program should be a number of things, mainly: Progressive, functional, specific and pain-free. With this in mind, I feel that the ideal gMed strengthening exercises will not be the same for each patient. The program must start at a point at which they can perform the exercises with proper form and technique, yet still be challenging. For some people, a single leg squat is nearly impossible due to reduced proprioception and strength. Others may be able to start at this point from the get-go. Exercises should then be progressed to the next level of difficulty when the patient is able to perform the set number with perfect form. The exercises selected should relate to the sport, exercise or activity the patient performs. What is functional to one patient may not be for another — think runner vs. gymnast. They should specifically target the muscle in question, isolating it as far as possible in at least one exercise to limit the contribution of other hip abductors. Finally, the exercises given should not aggravate the patient's injury and should be pain-free, or as close to pain-free as possible. In the early stages, this may mean that functional exercises are not possible. Squats, for example, often aggravate knee issues initially. My conclusion, therefore, is that there is no one gold standard exercise for strengthening the gluteus medius. Those who argue that nonweight-bearing exercises have no place in injury rehabilitation are in my opinion incorrect. Exercises such as the side-lying hip abduction have been shown to produce high levels of gMed activation and are ideal as a starting point for those who are unable to perform other weight-bearing exercises from the outset. (2) Presswood, L; Cronin, J; Keogh, JWL: Whatman, C. (2008). 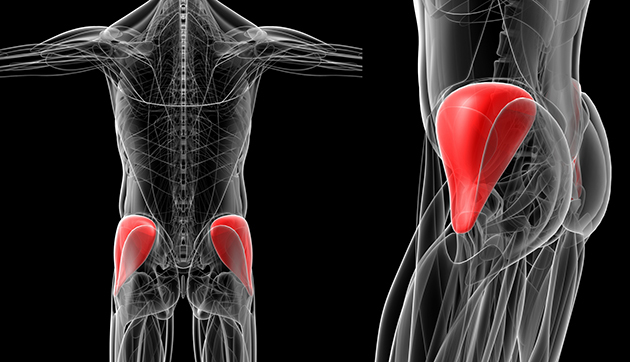 Gluteus Medius: Applied Anatomy, Dysfunction, Assessment, and Progressive Strengthening. Strength and Conditioning Journal; 30(5): 41-53. (3) McBeth, JM; Earl-Boehm, JE; Cobb, SC; Huddleston, WE. (2012). Hip Muscle Activity During 3 Side-Lying Hip-Strengthening Exercises in Distance Runners. J Athl Train; 47(1): 15–23. (4) Kristen Boren, K; Conrey, C; Le Coguic, J; Paprocki, L; Voight, M; Robinson, TK. (2011). Electromyographic Analysis of Gluteus Medius and Gluteus Maximus During Rehabilitation Exercises. The International Journal of Sports Physical Therapy; 6(3): 206-223. (5) Bolgla, LA; Uhl, TL.(2005). Electromyographic Analysis of Hip Rehabilitation Exercises in a Group of Healthy Subjects. Journal of Orthopaedic and Sports Physical Therapy; 35(8): 487-494. (6) O'Sullivan, K; Smith, SM; Sainsbury, D. (2010). Electromyographic analysis of the three subdivisions of gluteus medius during weight-bearing exercises. Sports Medicine, Arthroscopy, Rehabilitation, Therapy & Technology; 2(17).